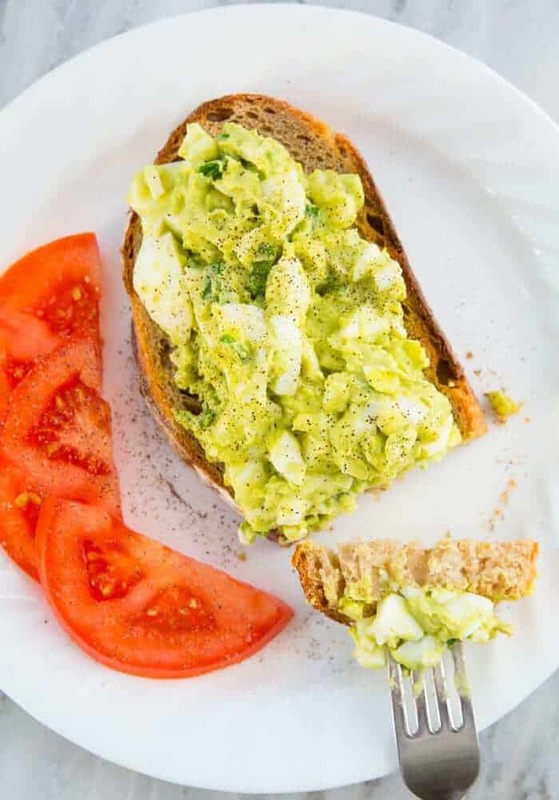 Avocado Egg Salad is perfect for those of you looking to lighten up egg salad. The avocado may still be loaded up with fat just like mayo is, but it’s all about the quality and type of fat – and if it’s a good fat or not! Avocados are loaded up with good fats and make this egg salad a nutritional powerhouse. You can get away with one tablespoon of mayo in this recipe if desired, but you might find you don’t even need it! 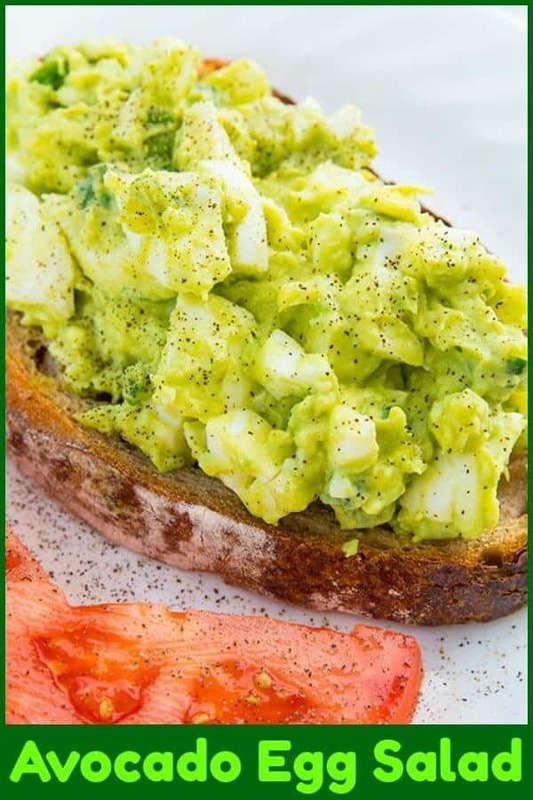 This avocado egg salad is perfect for those of you that are doing low-carb or good carb diets. ( Low carb = Keto, good carb = South Beach.) You can eat this on slices of cucumber or tomato if you want to eschew the bread, or use as a chunky dip for vegetables. I slathered it on a crusty, just barely toasted piece of sourdough from a place here in Edmonton and had it as an open-faced sandwich. It would also be perfect sandwiched between two pieces of soft, nutty whole wheat bread. Take 1/4 of the avocado chunks, place in a medium sized bowl and smash until smooth. Mix in the remaining avocado chunks, eggs, onions, mustard and if desired, mayo. Salt and pepper to taste. Serve on open faced toasted bread or as a sandwich filling. 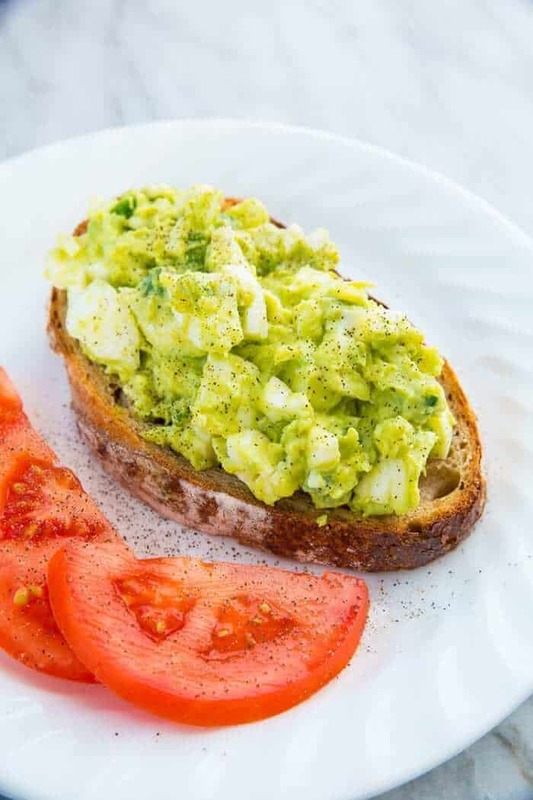 How long will avocado egg salad last? It won’t last at all. That’s the honest truth. It was brown within 20 minutes of my placing the remainder in the fridge for my son to eat later. I had hoped that the acidity of the vinegar in the avocado egg salad would keep the avocado from turning brown – like lime juice in guacamole does – but to no avail. You are going to have to make it right before you eat it, which is a drawback, I know. If the world was perfect, the best way to make sure that you get a great avocado that’s is perfectly ripe is to pick avocados the day that you are going to use them. Now we all know that we aren’t that organized all the time, so the day before is your best bet. There are running jokes and memes about how avocados are ripe for an instant, and then it’s too late. While that may seem like the truth, you can learn by feel how to tell if they are ripe. I pick avocados that are firm to the touch yet very sightly yielding. Don’t manhandle them, just gently squeeze them to see if they are firm and yield a bit. You don’t actually want avocados that are soft, they are always brown inside in spots. It’s also claimed that when the little remainder of stem at the top of the avocado falls off that they are ripe enough, but like anything that’s subject to your opinion. Make sure that the eggs are hard boiled with hard yolks for this recipe. You don’t need the extra creaminess from underdone yolks. You can add in mayo to taste, if you aren’t looking to skip it entirely in the recipe. I found that one tablespoon was enough to bring that tangy taste to the front, which really does make it see like it’s a real egg salad. You can use Dijon mustard in this as well, and play with the amount. The vinegar is to help cut through the richness of the avocado. Acids will give the taste of this avocado egg salad some balance, as will the salt. Without those, this is a too-rich sandwich filling without any taste depth. Hope you love it! Let me know if you tried it and if you made any delicious variations, just leave a comment in the comments section below! 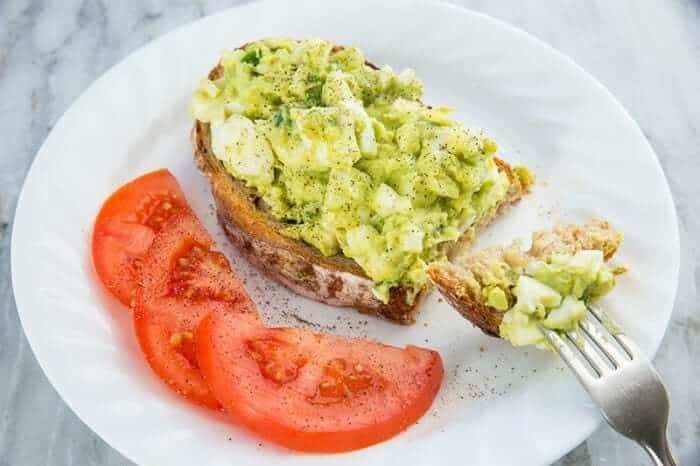 This Avocado Egg Salad can be made lighter with no mayo, making for an incredibly healthy sandwich filling or toast topping! About the eclair, I HAVE FOUND THAT A CUSTARD IS SO MUCH BETTER AND SUPER easy to make , all you need is vanilla instant pudding and heavy whipping cream, mix, and easy custard. Try it and you will live it!